예년보다 많이 따뜻했던 겨울을 지나, 이제는 조금 과하다 싶을 정도로 더운 봄을 맞이하고 있는 뉴욕 이노비 사무실에서는 3월 31일 베네핏 콘서트를 성공적으로 마치고 본격적으로 시작된 아웃리치 콘서트 시즌과 장애인의 달을 준비하며 바쁘게 지내고 있습니다. 2월 한 달 동안은 한국 출장을 다녀왔습니다. 이번 방문기간 동안 연대 의대 세브란스 재활병원과 서울 장애인 복지관, 이대 사회복지 대학원, 장로회신학대학원, 더 줌, 법무법인 강산등과 더 많은 협력관계를 위한 미팅을 했습니다. 그 외에도 이노비 서울의 류정, 유현정, 구진희, 이강수, 성기선 이사님들과 이노비 서울의 나눔 사업을 위한 준비 작업을 시작했습니다. 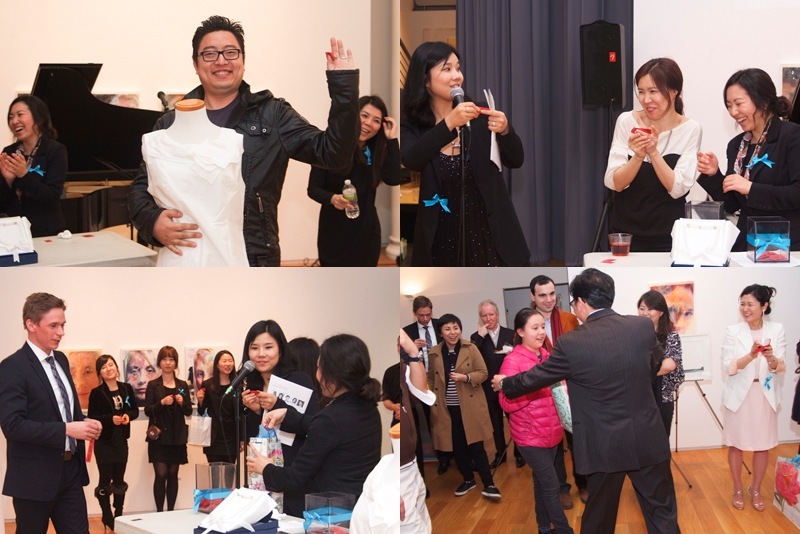 With the spring approaching, taking over an unseasonably warm winter, the EnoB NY office successfully completed its Benefit Concert on March 31st and is now focusing all preparations towards the outreach concert season and the month dedicated to the disabled. 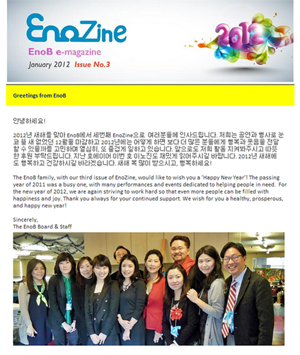 I spent the entire month of February in Korea and had a chance to meet many people and prepare for the opening of the EnoB office in Seoul. 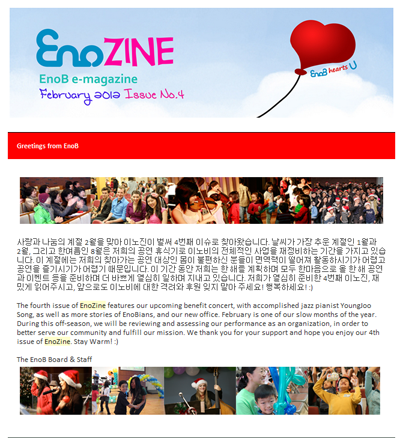 Through the EnoB in Seoul, we aim to spread happiness to patients, disabled, and multi-cultural families working with the Yonsei Severance Hospital, Seoul Community Rehabilitation Center and Wando Community Welfare Center. I hope you will continue to extend your support to our efforts in Seoul. Thank you. 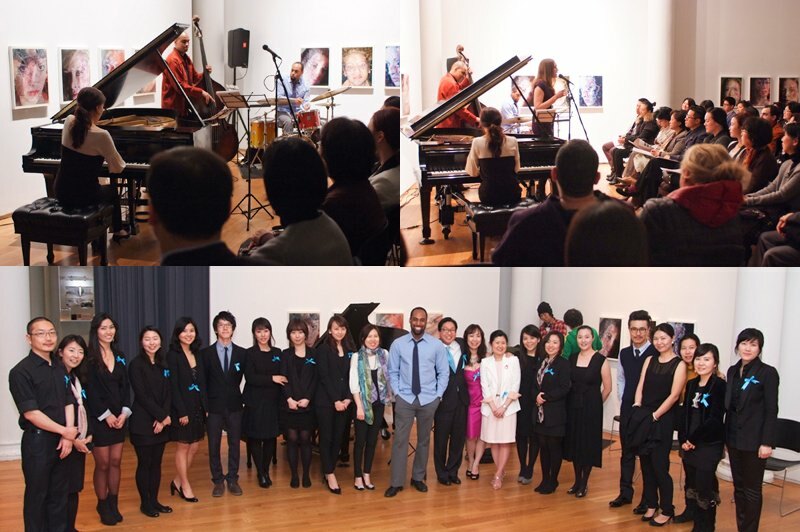 이노비 후원을 위한 베네핏 콘서트 "Spring Jazz Night with Youngjoo Song & Her Friends"가 지난 3월 31일, 맨해튼 TENRI 갤러리에서 열렸습니다. 100여석의 좌석이 모두 사전 매진된 가운데, 많은 분들이 찾아와 주셔서 재즈 공연도 즐기고, 이노비도 응원해 주셨습니다. 참석해 주시고 후원해주신 분들께 고개 숙여 감사 인사 드립니다. 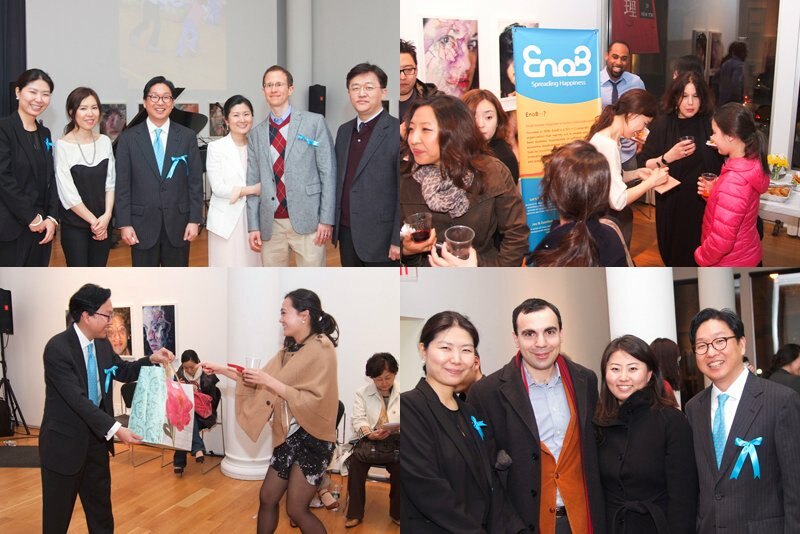 On March 31st, EnoB celebrated its benefit concert "Spring Jazz Night with Youngjoo Song & Her Friends" at the Manhattan TENRI Gallery. The concert sold out, making it a successful evening of music and joy with over a hundred friends and supporters. Thank you to everyone who joined us and for your continued support. 아래 동영상을 클릭해 베네핏 콘서트 현장을 동영상으로 느껴 보세요! 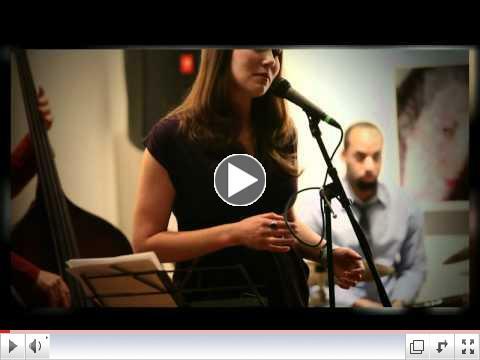 Enjoy the live video of our benefit concert! 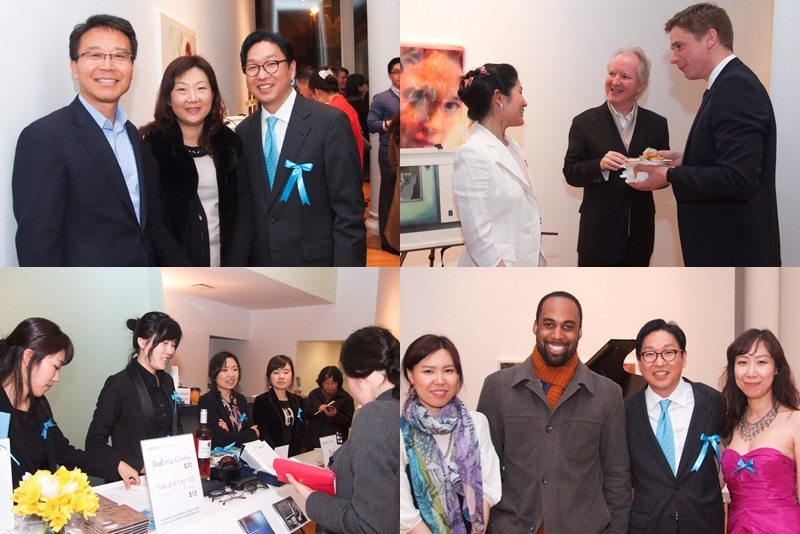 2012.03.31 EnoB Benefit Concert "Spring Jazz Night"
보내주신 성원에 힘입어 이노비는 앞으로도 소외되어 있는 많은 분들을 찾아가 무료 음악회를 열어드리며 사랑 나눔, 재능 나눔을 실천하겠습니다! We will continue to work on offering free concerts for underprivileged people, and practice sharing love and talent with your generous support. Thank you! 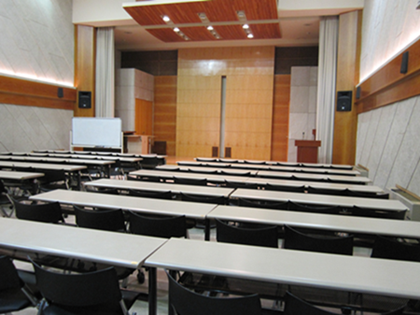 TKC 뉴스에 이노비 베네핏 콘서트 소식이 보도되었습니다. 강태욱 대표의 인터뷰도 보실 수 있는 뉴스, 함께 보실까요? 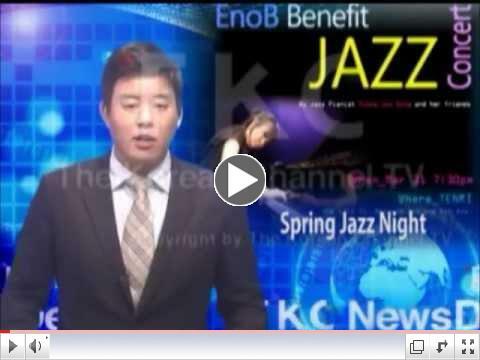 The story of EnoB's benefit concert was on the TKC news. 이번 호 이노진에서는 첫번째로 지난 2월25일 미국암협회 아시안지부와 함께한 암환자를 위한 콘서트에서 만나 뵌 최문갑님의 이야기를 소개하고자 합니다. 최문갑님께서는2009년에 유방암 선고를 받으시고 수술과 6번의 항암치료, 그리고 방사선 치료를 받으셨다고 합니다. 다행히도 수술 후 전이가 없으시다고 하시지만 투병 중 음식이 입에서 마치 톱밥같이 느껴지시고 몸이 불편하셔서 삶의 의욕이 전혀 없으셨을때 라디오에서 나오는 클래식 음악과 가곡등을 항상 들으시면서 마음을 위로하셨다고 합니다. 음악이 병을 이기는 큰 힘이 되어주었다는 최문갑님께서는 작년 11월 음악회 이후 이노비의 공연은 두번째 라고 하시며, 합창과 악기연주가 특히 좋으셨다고 덧붙이셨습니다. 또, 음악공연을 보러가고 싶어도 맨하탄까지 나가려면 시간도 없고, 몸도 힘드셔서 이렇게 찾아오는 이노비의 음악회가 너무 반갑다고 하십니다. 이노비는 찾아가는 음악회로 더 큰 기쁨을 드리고 싶습니다. 여러분의 도움이 필요합니다. 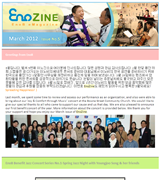 In this issue, for the first time, we share the story about a patient whom EnoB met at an outreach concert. 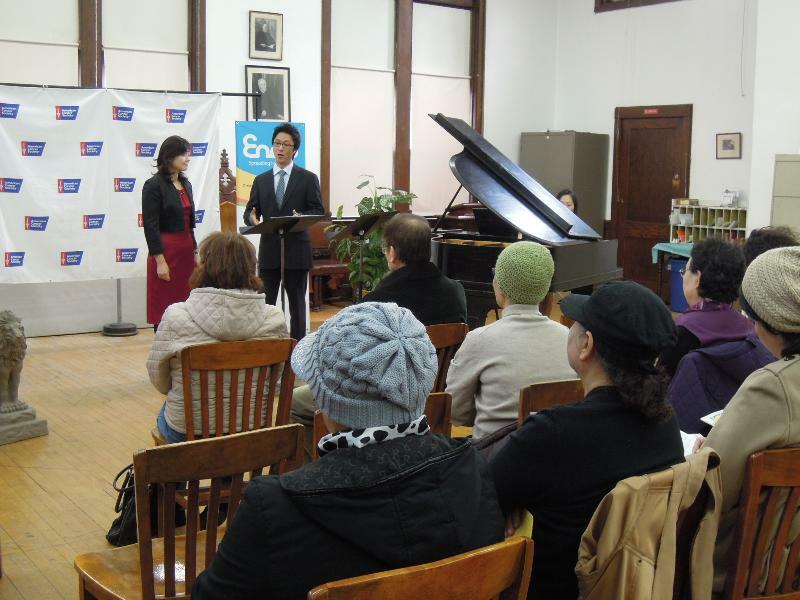 Ms. Moongab Choi is one of the patient-audiences of the outreach concert which EnoB held with American Cancer Society, Asian Initiatives on February 25. Ms. Choi was diagnosed with breast cancer in 2009, went through surgery, six rounds of chemotherapy and radiation treatment. Fortunately, the cancer did not spread into her body after the surgery. However, while recovering from her cancer treatment, she lost a bit of her spirit due to the extreme physical discomfort - she was suffering from loss of appetite and her body didn't work as she wished. Her only consolation was the classical music and Korean arias that played from her radio. She said "This is my second time meeting EnoB's music after the concert in November 2011. I loved the choir and string performances the most." She also mentioned, "Music has been the key to my recovery from cancer. EnoB's outreach concert is so special to me because it is very hard to go see live music, usually in Manhattan because it's too far and tiring for me to travel to the city." Stories like Ms. Choi's is the driving force for EnoB - to spread more hope and happiness to those who are often overlooked through the outreach concerns. 달팽이가 언덕을 오르고 아이들은 언덕을 뛰어 놀며 봄을 맞이합니다. 아이의 큰 손은 무엇이든 해낼 수 있는 꿈과 희망을, 각각 다른 두 발은 어디로든 나아갈 수 있는 자기 자신의 미래를 뜻합니다. "The Children who brought Spring"
The snail is climbing up the hill and the children runs on the hill. The big hand of children means dream and hope which make them to do anything. Their two feet lead them in any direction that their future may hold. 이노비의 봄 로고는 김강현님께서 이노비를 위해 제작해 주셨습니다. 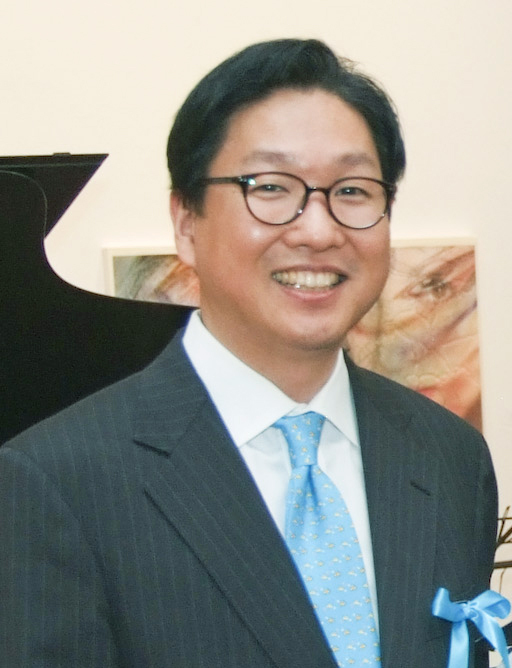 2009년 삼성 SDI 에코캐릭터 공모전 동상외 다수의 수상 경력이 있으신 김강현님은 현재 한국 Bridea(브리디아) 에서 게임원화가로 일하고 계십니다. 장애 아동들을 돕고 있다는 이노비의 소식을 들으시고 자신의 재능으로 도움이 될 수 있으면 좋겠다며 기쁜 마음으로 로고를 제작해 주셨습니다. 로고를 보고 있으면 그 따뜻한 마음이 그대로 전해지는 것 같습니다. Winter Logo에 이은 Spring Logo도 많이 사랑해 주세요. 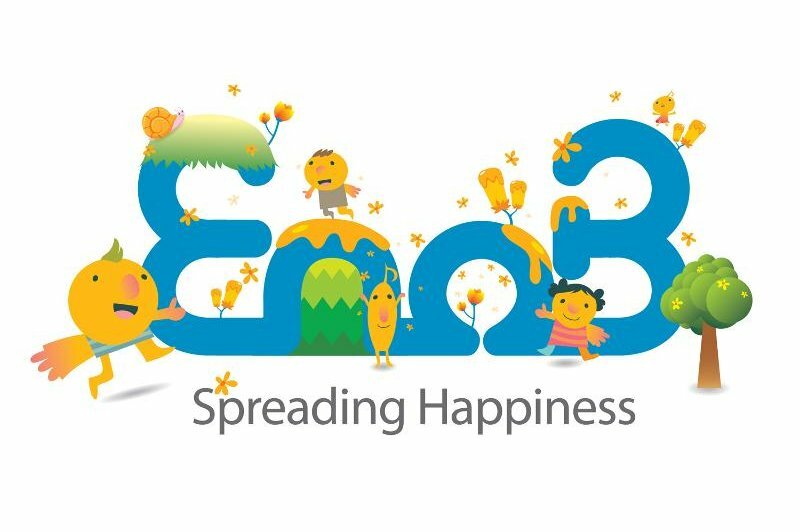 The Spring Logo of EnoB is designed by Kang Hyun Kim. He is an acclaimed artist, recently awarded the third place award in the Samsung Eco-character contest. He now works as game-illustrator at Bridea Korea. 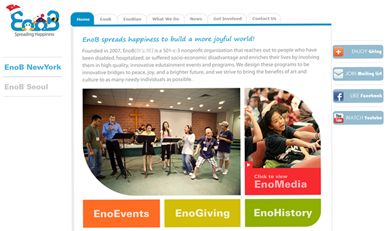 He volunteered to design the logo after he heard about EnoB's vision. His logo fulfills our mission of extending goodwill and compassion for those in need. NYU 예술경영 학과장이신 Brann Wry 교수님께서 이노비 사무실에서 미팅을 가졌습니다. NYU 예술경영 학과의 인턴십 호스트 기관인 이노비는 앞으로 NYU와 더 폭넓은 협력관계를 유지하기로 했습니다. 또 이번 미팅을 통해 교수님으로부터 여러 조언도 들을수 있었습니다. 이노비는 서강대학교 국제대학원과 중앙대학교로 부터 인턴 학생을 받은바 있으며 Monchair State University와 이대 사회복지 대학원의 인턴십 호스트 기관입니다. Brann J. 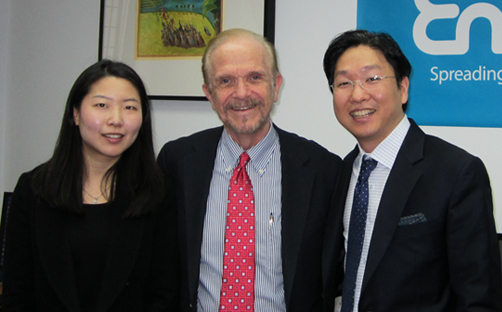 Wry, Director of Performing Arts Administration Program, Cooperative Program of the School of Education and the Leonard N. Stern School of Business of NYU, came to EnoB's office and had a meeting with EnoB President Tae Wook Kang. 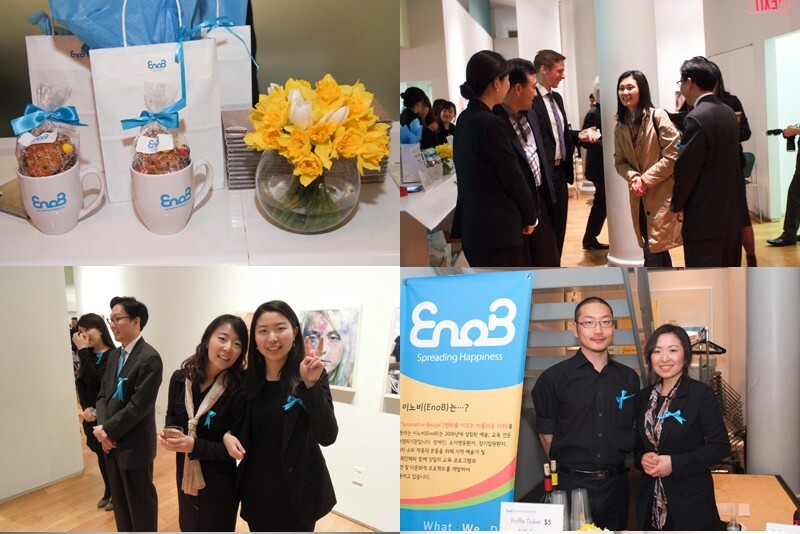 He promised that he would maintain a partnership with EnoB by hosting NYU student internship program. EnoB has hosted interns from Graduate School of International Studies of Sogang University and Choongang University and is currently hosting interns from Dept of Family and Child Studies - Montclair State University and Graduate School of Social Welfare of Ewha Women University. 아동 동화 작가이자 삽화가이신 최양숙 이사님은 한국에서 태어나 대학을 졸업하고 미국으로 이주하여 Kendall College of Arts and Design, New York School of Visual Arts에서 illustration을 공부하였습니다. 1997년 첫 동화 '해님 달님(The Sun Girl and the Moon Boy)'을 펴내면서 미국에서 동화 작가로 데뷔, 현재까지 총 12종의 책을 펴냈습니다. 1997년 Publishers Weekly '가장 뛰어난 동화 아티스트' 중 한 명으로 선정되었고, 한국에서 한글 번역본이 출간되기도 한 '내 이름이 담긴 병(The Name Jar)'은 시카고 공립도서관이 선정한 최우수도서로 뽑히며 5만권이 팔린바 있습니다. 이노비는 최양숙 작가님에게서 기부하신 오리지널 일러스트 작품을 판매하고 있는데, 이에 따른 판매 수익의 50%는 이노비에 기부되며 나머지 50%는 북한고아들을 위해 사용됩니다. 오래전 부터 고아들을 위해 많은 봉사를 하시고 계시는 아름다운 마음을 가지신 최양숙 이사님의 그림에서는 그 따뜻함이 그대로 느껴지는 것 같습니다. 그림 구매 문의는 enobinc@gmail.com이나 212-239-4438로 해주시기 바랍니다. 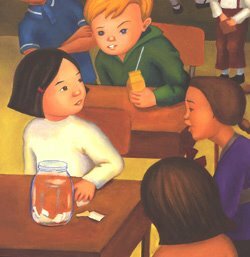 Ms. Yangsook Choi is a children's book author and illustrator. After graduating college in Korea, she studied illustration at the Kendall College of Arts and Design, New York School of Visual Arts. Her first children's book in English was 'The Sun Girl and the Moon Boy,' published in 1997. She was lauded as one of the 'best children's book artists' by Publisher's Weekly. To date, she has authored and illustrated twelve other children's books. 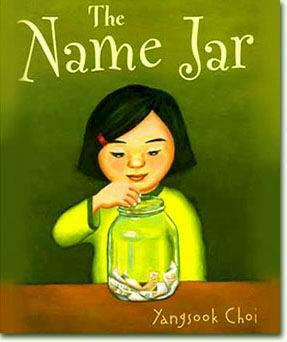 Her book 'The Name Jar,' published in both English and Korean, has sold 50,000 copies and was proclaimed by the Chicago Public Library as one of the best children's books. Ms Choi has donated some of her talent and works to EnoB to the orphans in North Korea, and in an effort to raise additional funds. For inquiries regarding her art work, please contact us at enobinc@gmail.com or 212-239-4438. "Choi's gleaming, expressive paintings are always a treasure... Choi adapts thoughtfully to her new environs, without submerging her unique artistic identity." Marketing Manager로 새로 합류한 Jenna Kim 매니저님을 소개합니다. 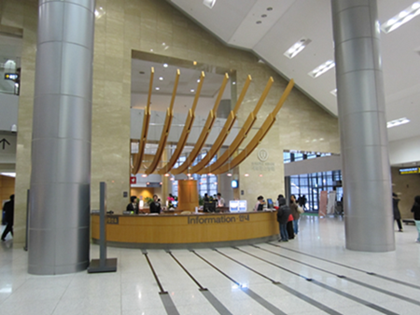 그리고 권주리, 양매화 coordinator가 각각 Admin Manager, PR Manager로 승진했습니다. 축하해주세요! 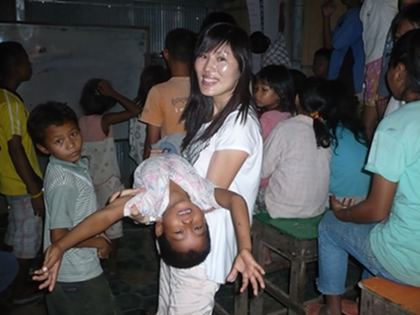 Introducing EnoB's new Marketing Manager, Eunbok Jenna Kim. Ms. Kwon and Ms. Yang were promoted from coordinator to manager. Since March, EnoB has had the pleasure of welcoming new bright and energetic interns. Our staff is having one of the most enjoyably active times in the company of our new additions. Meet our growing team. COCO Service Center is a 501(c)(3) non-profit organization that provides support for people with disabilities and their families. EnoB has co-hosted its outreach concert with COCO Service Center since 2008 and it will continue the partnership with COCO this year. Mercy Garden is a nursing home serving low-income and medically at-risk seniors. Their population are often abandoned or seldom visited by their families, so the relationships built can become an important lifeline for them. We hope our visits help lessen the isolation and loneliness that some of residents.